Rellian is a Redguard drillmaster who can be found causing trouble at the Five Claws Lodge in Leyawiin. He is a member of the Leyawiin Fighters Guild, and along with his associates, Dubok gro-Shagk and Vantus Prelius, they are sitting around, drunk and disorderly, because there is no work for them to do. Rellian is the quiet one of the three. Talk to Vantus in order to deal with their problems. Rellian is equipped with a set of leather armor, missing only the helmet. 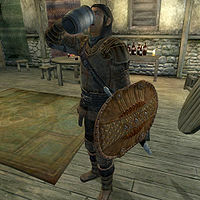 He is armed with a silver longsword and carries a pewter mug and a small amount of gold. When you first encounter Rellian to complete the duty given to you, he will immediately make it clear that you aren't welcome as you approach him: "This is not your affair." If you are not deterred by his hostile behavior, he will make it abundantly clear that he does not want your help if you start a conversation with him: "You'll keep your nose out of this, if you know what's good for you." If you persist by asking him why he is causing trouble, he'll explain what's wrong: "Trouble? Trouble? You're damn right! But it's not us, friend. The real trouble's with the Blackwood Company. They're what's causing trouble." Asking him about the Blackwood Company will have him direct you towards Vantus for more information: "Mercenaries is what they are, and they've hung up a shingle here in Leyawiin. Vantus can tell you more." If you end a conversation with Rellian at any point before you've agreed to help the group, he will once again tell you to leave them alone as you leave: "Mind your own business." After agreeing to help the unemployed trio, Rellian will stop insulting you on sight whenever he sees you—though he'll still be rather impatient with you. Approaching him will have him greet you by saying: "I'm waiting." Starting a conversation with him will have him remind that you still haven't solved their problem: "Something you need? We still need work." Asking him about new Fighters Guild jobs will have him grumble about his current unemployment: "I'd love some work. Seems like joining the Blackwood Company is the only way to get it, though." Once you've managed to find new work for the group, but have yet to report to Vantus, asking Rellian about jobs will have him direct you to Vantus: "Some work would be a gift from the gods. If you've found something, tell Vantus." Ending a conversation with him before they have regular work again will have him remind you that they're still unemployed: "All we want is work to do." Rellian will shout random insults at the other people inside the bar. He'll have the following things to say towards Vantus Prelius: "We wouldn't be here if you'd done your job!" "I should have stayed in Hammerfell." "You're not half the man your father was." Rellian will have a few remarks directed towards Dubok gro-Shagk: "You? You wouldn't know a good sword if it stabbed you in the throat!" "Go back to your sty, pig man." "I've ridden horses with better sense than you." He'll have the following to say to the bartender, Witseidutsei: "Don't get your tail in a knot." "Send me a drink, barkeep. And make it quick." "What are you looking at? Keep pouring drinks!" Rellian will also discourage you from getting involved occasionally: "What are you doing here?" "Keep walking, stranger." "Move along." After you've informed Vantus that you've found new, regular work for the group, approaching Rellian will have him change his tune towards you: "Thanks again." Starting a formal conversation with him will have him once again voice his thanks: "Can't thank you enough for your help. What do you need?" If you ask him about his job situation now he will reply: "It appears we'll be busy for the foreseeable future. Thank you." Ending a conversation with him will have him once again thank you as you part ways: "We appreciate it."